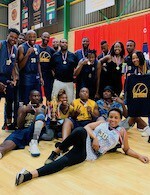 Team World scored a 96-92 victory over Team Africa in the 2018 NBA Africa Game on Saturday at Sun Arena at Time Square in Pretoria, South Africa. Los Angeles Clippers forward Danilo Gallinari (208-SF-88) led the way for World with 23 points as he connected on nine of his 10 shots from the field en route to MVP honors. Dallas Mavericks forward Harrison Barnes (203-F-92, college: N.Carolina) added a double-double with 14 points and 11 rebounds. Philadelphia 76ers center Joel Embiid (213-C-94, college: Kansas) shined with 24 points, eight boards and four assists for Africa. Former Sixers teammate Timothee Luwawu-Cabarrot (201-F/G-95, agency: BeoBasket), who was traded to the Oklahoma City Thunder last month, chipped in 16 points. This year's NBA Africa Game was played in support of the Nelson Mandela Foundation as part of the 2018 Basketball Without Borders Africa camp festivities. Los Angeles Lakers forward Luol Deng (206-F-85, college: Duke, agency: Interperformances), who's taken part in all three Africa Game contests, spoke with Stuart Hess of IOL Sport about the event's growth in a short time. "A lot of people deserve credit for the growth of the Africa Game," Deng said. "Amadou [Gallo Fall] has done a great job, as has the NBA just for putting the game together, and then South Africa deserves a lot of credit for hosting and making people feel comfortable coming here." He added: "For these kids, when they meet us, see our sense of humor, they realize we are just like them, and they start believing. 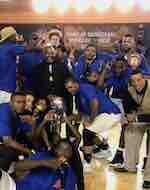 That's why you see more kids from BWB making it to the NBA." The sides traded the lead 10 times in the first quarter-and-a-half, which featured the pace and style of an All-Star Game, before Team World started to take control in the second. Team Africa made a charge in the fourth quarter, trimming its deficit to three at a couple of different points. It could not get over the hump, however, as Team World came up with key stops in the final minutes. Team World improved to 3-0 in the NBA Africa Game, which debuted in 2015.